loving. living. small. | live small with style: TO ALL THE LOVING. LIVING. SMALL. READERS....How Does Living Small Inspire YOU? How Does Living Small Inspire YOU? I would love to hear from you lovely LLS readers! What do you love about living small and why does it work for you? And anything goes - is it piece of furniture? The color of your walls? The cozy feeling of your bedroom? The way the sunlight streams through your small kitchen? More affordable? Less stressful? Whatever your inspiration is can absolutely inspire others. Send me an email or leave a comment below. Looking forward to reading about your small space loves! I love listening to the radio, and stay away from TV. Part of it is due to my 14 years of photo studio work. (My blog is part of my reflective journaling). nice blog...now here's something for you...how are you going to design a 64SQm piece of raw house? saw your blog in the blogs of note! Oh I love your blog. As one who has recently downsized from a 3-bedroom home, to a 2-bedroom apartment now on to a Studio in downtown San Diego - I applaud you for your blog and all of the tidbits I can steal along the way. Bravo. I think I shall read your entries daily and link you to my page as well so others are drawn. While I wont be able to paint, pictures, decor, mirrors and light are my focus on making my space livable! Oh and congrats on being a "Blog of Note" today! Truly your blog is wonderful..I enjoy reading it...and i am also living a small apartment...hehe..
Hey there!I am an engineer and I am currently living in a village in order to teach electronics to poor kids who can't afford education! I have to bathe with well water and live in a house made of stone. Let me not get into that, the whole point is that I dream of having my own house and living comfortably!! The sight of that white kitchen had me drooling all over my laptop! My dream is to build my own home: Picture a small cottage just a walk away from the beach, adorned by a small garden and a cute little cobblestone pathway! The architecture of the cottage of course would be unique and simple. The interior would be light and I would prefer a white and gray look in the hall. Chairs though will be replaced by mattresses laid down on the floor and decorated with rugs and cushions. I would love to have a bar area that would be stocked with fruits instead of drinks. Fruit salads and mocktails are my fav!! A sound room is a must and must accommodate my keyboard(I hope to graduate to a synth by then) and my boyfrnd's drums and guitar! The bathroom should be a haven! Well, I guess you get the idea. Am sorry I got carries away with my description but this dream helps me live in a village that is the size of a large farm! Thanks for your time! Take care and keep smiling! Living small means I can live alone, which I truly value. Eventually I will live with my boyfriend, but even then hopefully we will live small and reduce our carbon footprint. Overseas (ie not in the USA) it is much more common for more people to live in a smaller space, even for those who are well off. it's more efficient and better for the earth! I liked what you said about the gray walls. I have pale grayish-blue walls in the kitchen, lots of windows, and no window treatments, and I love the shadows the sun makes on the walls as it moves through the day. We live in a 1950s ranch in a community of many McMansions. While it can feel too small as my daughters get bigger, at the same time we don't regret living this way. I don't know how I could take care of a bigger house anyway! Also it allowed us to have money to do fun things and not just pour it into a house we couldn't afford, unlike many people we know. To find out more about me, please visit my blog at Itsacynicalworldafterall.blogspot.com, and thanks! Wow, I cannot believe I found a blog like this. I thought I was the only one who thought this way. congrats on being acknowledged in "blogs of note" - your work here deserves the recognition. what I love about living small (568 sq ft) is the daily discovery about how little I actually need to be happy. Of course it helps to be making this discovery on a tropical island! 1) this was already mentioned, but...it's all mine! I love that for the only time in my life, I could use as much pink paint as I wanted. 2) I love how it forces you to edit. I'm a designer, and constantly have ideas swirling in my mind. But there's only so many you can execute in a small space, so they have to amazing! A small space makes you appreciate every inch of your home or room so much more. You focus on obtaining furniture that has utility / function as well as style. It becomes a mission to remove all the unused fluff, and just keep what you need. A large space just isn't as intimate as a small one. Living in a small place has it's advantages and disadvantages. The disadvantages: Not enough storage. I also wish I had an extra room that I can use as a studio. Advantages: Makes me not have things that I don't need. And having a small place does make it look cozy. Wow, found your blog from 'blogs of note'. Congrats! Love the tips you have been sharing. They are great. What I like about living in a small place is the constant planning and economizing I have to do to make sure every inch counts. I really like creating restful little corners using small finds from flea markets. They somehow make me feel more restful, than purchasing a big expensive piece from a major brand store. excellent blog and wonderful posts. Well, it's been just a month since I started living on my own. I share my small apartment with a friend who happens to be an artist too. However, we have a loft as our bedroom (so privacy set aside, for now). I love feeling the warmth of day waking me up each morning. Then nothing beats drinking my first cup of coffee for the day in front of my laptop. I'm small! -that's short ;) There's no other way than living small to feel in your own. A cat, a PC and sunrays through the top window is all I need in cold seasons. In summer my other side is looking for loving wide blue skies. Oh, what a great blog! So many wonderful ideas here ... I live in a large teak house at the moment (which I of course love), but I see myself eventually in the house of my dreams ... one big cozy room with a fireplace, bed, kitchen space, and small library all contained therein. You've given my plenty of inspiration -- thank you!! I'm so glad I found your blog! It's great and I love the way you think. I love living in our small home because my family is never far away, we can hear each other from anywhere in the house, we rub shoulders as we walk down the hall, we all share the space. My living area functions as a living room, family room, playroom reminding me our daughter is always near. :) Because our home is small it forces me to make the best use of my space and try to make things as functional and beautiful as I can. I am really glad to have found your blog. I think the pictures are very impressive and thoughtful too!!! Living small seems to be the new mantra now, at least for people like me who hop from one country to another within a span of a year or so.To me, it means the luxury of being able to live minimalistically, without bothering too much for the costs and being at peace with yourself, your pocket and the Universe.A sense to belonging to the world when visitors trickle in, and a sense of isolation when I sit in the ray of sunshine streaming onto my notepad as I attempt to write a few lines. 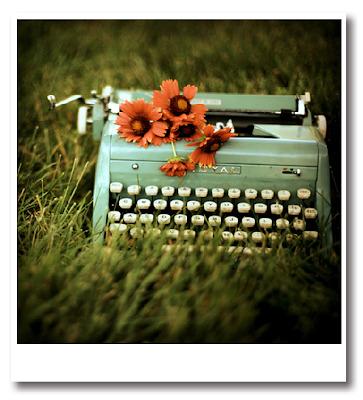 And then, when you see a picture of a typewriter with flowers on a person's blog, you just cannot help replying!!!! Your blogs are truly wonderful!! I love the fact that no space in my house is wasted. Everything has a purpose, there are no "extra" corners. It makes you think about every square inch of your home to make sure you're using it in the most most clever way you can think of. I have lived in small studios and the tiniest bedrooms. Living small is just right for me and the few things that I have. When I finally moved into a two bedroom apartment, my first nights were spent sleeping in the front room because I wasn't used to all of the space. i love small spaces because i like the idea that everything is within my reach. i used to live in a huge house and i always felt alienated because of the lack of "closure". small homes make me feel more attached, more emotionally secure. Do you have any ideas for decorating a small loft for a flute playing bibliophile? Your blog abounds with color and creative ideas. You blog of note thing was well deserved. I moved from the smallest room in the house to the second largest bedroom. I only love it for its warmer temperature - the other room was super chilly! I'd end up wearing twice as much clothing as anybody else. I like smaller rooms because I think they are more beautiful and they encourage neatness and who doesn't love a cosy nook to curl up in? I do!